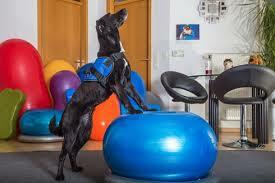 This is such a common question I am asked during a physiotherapy session with a canine patient. It is a common misconception that muscles just grow back to normal size by themselves after injury or surgery. Unfortunately for the patients, this is just NOT the case. 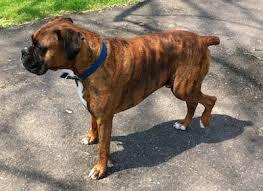 Muscle atrophy, or wastage, starts early on in the process of injury or disease. 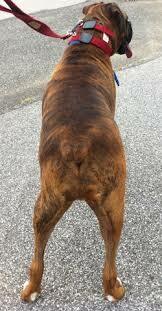 It may initially go unnoticed, particularly if your dog has a longer coat. If your dog becomes acutely lame or has surgery on a limb, the atrophy will be more noticeable, more quickly and will actually get a little worse before it gets better. Muscle atrophy occurs for a variety of different reasons. It can occur in response to pain, for example if your dog injures their stifle (knee joint) or has some arthritis this will cause pain. The pain in the local region causes the muscle fibres to not fully switch on and so weakness and atrophy result. Another reason for muscle atrophy is disuse. If your dog has been limping and not using a limb, for example if they have had a mild injury, some arthritis, or are confined after surgery or injury, then the muscles are used less than normal and atrophy results. We may see generalised disuse atrophy of the whole body in a dog that has prolonged restricted activity or crate rest, or specific atrophy of an affected limb or limbs that have been injured or had surgery. Because dogs get around on 4 limbs, if they have a small amount of discomfort in a single limb, they can transfer weight around to unload the painful limb much easier than we can on only 2 limbs. In the early stages this can go unnoticed, however if we palpate the limbs, we may find a difference in muscle size – indicating some atrophy in the affected limb. When disuse and pain are both present, then atrophy can be pronounced. A compounding problem to muscle atrophy is muscle inhibition. Inhibition is essentially the partial or complete shutting down of a muscle. What this means, is the nerves that normally are sending and receiving signals within that muscle are sending distorted messages or have stopped sending messages altogether. This issue can arise from factors such as swelling, inflammation, joint laxity or instability and pain. It is extremely common to see muscle inhibition in the quadriceps group after knee surgery in both dogs and humans, and in the triceps muscle group in dogs after elbow surgery. So when your dog has surgery for a ruptured cruciate ligament (ACL), they will get generalised muscle atrophy of the affected limb from pain, and some disuse atrophy due to lameness. They will also very typically have muscle inhibition of the cranial (anterior) thigh muscles due to pain, swelling and inflammation from the initial injury and then the surgery itself. This results in an imbalance of muscle forces around the joint- so other muscles will tighten and can become overused, in an effort to try to compensate for the inhibited ones. Unfortunately, these safety mechanisms of the body are not the best thing for it- such compensatory patterns lead to joint movement limitations and can cause misalignment within the joint and altered movement patterns. To further the problem, weak muscles become weaker whilst the strong muscles become stronger, and unfortunately trying to strengthen inhibited muscles is not possible because they are not receiving normal neurological inputs. How Do I Treat Inhibition And Muscle Atrophy? If a dog is left to recover after surgery with just crate rest and a progressive walking program, the muscle inhibition and atrophy will persist. Sure, some muscle will grow back once lameness subsides, but the muscle won’t ever get back to normal of it’s own accord. In addition, the altered motion patterns and compensation that develop with inhibition won’t rectify themselves. The result is a limb that is not moving as well as it could, affecting strength and motion. So the body must compensate by transferring the weight around elsewhere within the body- leaving other areas vulnerable to injury. We can address this with a specific structured rehabilitation program targeted to meet the individual needs of the patient. So it is worth considering- why would you spend thousands of dollars on a surgery for your dog to stabilise a joint and then not follow up with rehabilitation that maximises their functional outcomes? Muscle inhibition must be addressed first- so any pain, swelling and inflammation need to be managed. This may be done through medication, ice and exercise restriction. We can then specifically target the affected muscles with either sensory inputs, such as soft tissue therapy techniques, or by stimulating the nerve with dry needling or neuromuscular electrical stimulation. Through targeted stimulation we can assist the muscle that has been inhibited to start to fire up again. At the same time, we can help to decrease any tightness present in the other muscles surrounding the affected joint through manual therapies and stretching and strengthening of specific muscles. Techniques chosen for each individual dog are based on our assessment findings , which enable a tailored program to be devised. Once inhibition is addressed, we can start specific muscle activation and strengthening exercises. In order for a muscle to strengthen and grow in fibre size, we must follow the principle of overload- meaning the fibres must be stressed or overloaded to make them adapt and strengthen. This must be done very carefully after surgery so as not to jeopardise healing and repair. Home exercises begin very gently and are progressed based on assessment of progression. Hydrotherapy- particularly underwater treadmill- is a great way to overload muscles without overloading the painful or healing structures. Swimming and walking are more endurance than strengthening exercises- they work on low load and multiple repetitions; so there will be some return of muscle strength with these activities but alone they are inadequate to get a muscle back to its normal strength. Once healing has taken place, we can really ramp up strengthening exercises and resolve muscle atrophy fully. When we can establish that muscle strength and size have been fully restored, it is only then we should progress a canine patient back to regular exercise. This will give them the best chance for maximal recovery and lead to optimal performance in life and any exercise they pursue. 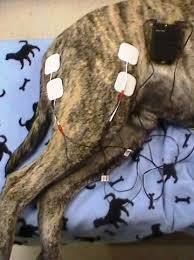 Tags: canine rehabilitation, cranial cruciate ligament, dogs in motion, inhibition, muscle atrophy | Permalink.